I was fortunate to recently add a long-needed activity patch need from the 1980's with a recent eBay purchase. Now I only need one more to finish up all of the activity patches from this decade. 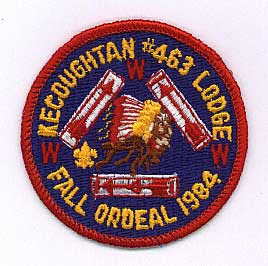 So if you happen to have a spare Kecoughtan Lodge 1988 Summer Ordeal patch I know a good home for it! These would appear to indicate that for the upcoming 2009 Conclave Wahunsenakah Lodge will issue 2 different premium flaps with a restricted number allowed to be purchased, a delegate "trader" flap, a staff flap, and a beaver day flap. The beaver day patch is earned by providing a minimum of 14 hours of service during the Lodge's scheduled beaver day events held in preparation of the upcoming conclave to be hosted by Lodge 333 at Bayport Scout Reservation (see Wahunsenakah Beaver Day flap expected). 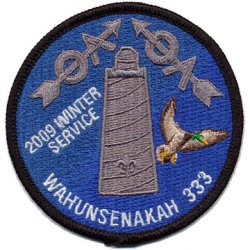 Wahunsenakah Lodge 333 held their Winter Service weekend (formerly known as the Winter Ordeal) on Feb. 20-22 at Bayport Scout Reservation, and issued the patch pictured above. This patch design was approved earlier with varying backgrounds for all of the Lodge 333 events in 2009 (see Wahunsenakah Lodge 2009 Event Patch Sneak Preview). The removal of the word "Ordeal" from the patch does not indicate no Ordeal was held, in fact over 90 candidates were expected according to notes from the Feb. 8 LEC meeting. The decision to change the wording to "Winter Service" was to recognize that the Ordeal was only a small part of the weekend and that the greater purpose for all involved was to provide service to the camp. You will find pictures and descriptions of every Wahunsenakah Lodge activity patch since the Lodge was formed in 1996 through today on the Wahunsenakah Lodge Activity Emblems page. On February 1st the Chesapeake Bay District of Colonial Virginia Council sponsored their annual Scout Sunday (view flyer) with a 7 AM service at the Yorktown Monument, followed by breakfast at the local US Coast Guard Base. Larry Johnson previously provided me with many images of the patches that have been issued for this event, and you will find all of them in the District Emblems section of the Colonial Virginia Council Emblems page. This year's version with yellow border and multicolored sunrise is an especially nice addition to this unique set of Scout emblems. 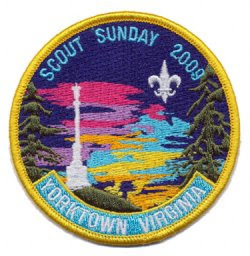 Thanks to Larry Johnson for sending the picture of the 2009 Scout Sunday patch.